with the starting meditation on January 1st. for the crystal skull guardians to become fully and completely united!! how you can participate in the new meditations we will offer throughout the entire year of 2012. For this next series of world peace meditations we are offering for 2012, this page shares various suggestions on how you may participate. Again to summarize, how this meditation is to be performed, it will go as follows. 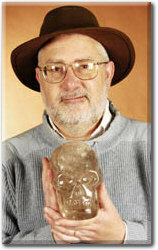 First, if you are a crystal skull guardian, you will select a crystal skull that you will hold during the meditation. 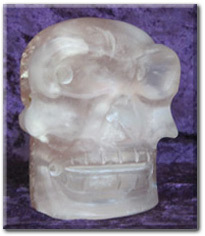 The use of the crystal skull will help to amplify the loving energies we will be sending out to the planet. If you do not possess your own crystal skulls, you can substitute a piece of quartz crystal to hold. Following below in the next section is a suggestion how to activate this quartz crystal prior to the meditation so it will be ready to be used in the meditation. This form of the meditation we are offering is one which Joshua (working with various partners for the Crystal Skull Explorers) has lead during numerous public talks that have been given all over the world for many years. We have selected this simple meditation because we believe in each place that it has been performed previously, a special energy has been setup. As more and more people perform this meditation in new locations throughout the world, the energy created previously is then linked and intensified with the new meditation in these former locations. And then there is a kind of matrix of loving and peaceful energy being created in many parts of the world. 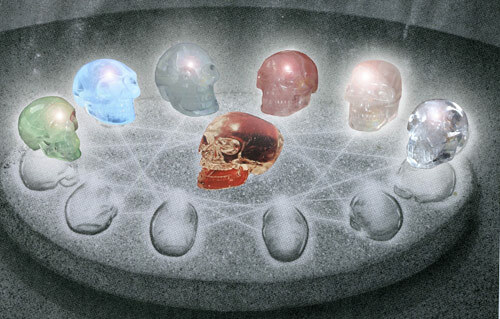 Now our goal has been since we started there meditations to try to work with as many crystal skull caretakers in the world as possible at one time and on one day to concentrate together and collectively creating a geometric amplification of the healing energies enhanced by our personal crystal skulls. But undoubtedly, we will have some people who wish to join us that do not have their own crystal skull, so below is a suggestion how such individuals can still participate and be a part of the meditation. Also we do offer a mailing list for updates about the meditation, see at the bottom of this page how to become a member!! For the 2012 version of the Crystal Skull World Peace Meditation, we will only be performing the mediation once each time we do one of the 13 meditations for 2012. This will occur at 1 PM (13:00) your local time, which is the 13th hour of the day. What this means is that we will have people performing this meditation at the 13th hour in every timezone on the planet. Now if for some reason (either the meditation occurs during the week and you are working or you have personal matters to attend to) you are unable to do the meditation at the exact time it will occur, there is another technique you can use below to do the meditation the evening or a few days before. (Note: We recognize that this meditation we are proposing, may not be appropriate for everyone to follow or maybe you have a different and personal meditation you do which works better for yourself. However, we believe that we can send out the most powerful loving energy when people are doing a meditation which has the same basic focus. Such a mediation will project outwardly a geometirc multiple of the power of each individual. The key is, as best as you can, is to link into the essence of your personal crystal skull (or quartz crystal) and combine this energy with a powerful visualization of a loving and peaceful energy being shared with our whole planet. So feel free to choose what is the best form of the meditation to do for you. We recommend to do the meditation for 10-15 minutes but if you want to go longer, of course you may (in the spoken meditation we will try to have the mediation go for about 13 minutes). With the new version of the meditation we are offering for 2012, we have created a new initial exercise that will assist you to link into what we call “The Crystalline Frequency”. This special frequency is linked to the universal heart - love energy that exists in the higher dimensions or planes of existence. Thus by adding this energy to our meditation, it will take our collective group efforts to a more pure energy that we will share with "Mother Earth" and all the living beings upon (and within) “Her”. The goal of our group mediation for world peace for today is to focus together upon the “Unity Consciousness” which exists at the center of our being. That is, to link into the highest capacity of the Universe comprised of “Infinite Light”, “Love” and “Power” in their Divine Right Order and Harmony. Now spend a minute or so in the sensation of this crystalline light moving through your body. Imagine the beautiful dance of the crystal light moving in and out as you feel yourself being sustained and nurtured by this liquid light. Take a deep breath in and let it out as you allow the frequency of a unity crystalline light to energize you and prepare you for our meditation. As you breath in the “Crystalline Light” your being becomes open to the consciousness and energy from the Universe – celestial fields of energy and light. So enjoy your experience now as you link into these universal energies – these energies which are a part of the inner-most part of each of our being. Next, in order to bring forth the Eternal Infinite Light of the Universe which represents unity and oneness we must activate and firmly anchor the four crystalline pillars of light in the four directions. After this is done we continue to call forth the spirit of the “Mother Earth” and “Father Sky” and finally add the love energy from our heart chakra. Our crystal mission for this day is work together with all the other people who are meditating at the highest level of unity as we can. To become a channel for the Eternal Infinite Light so we can bring forth these universal energies to be more permanently anchored into the Earth or the physical density. Next begin to feel this pink ray of light pulsating in your heart (which represents our true inner star situated at the core of our being). Place your inner focus upon the inner chamber of your heart. Now feel yourself sinking deeply into the inner layers of your heart, moving deeper and deeper into this multi-dimensional organ and finally feel yourself arrive at the deepest layer of your heart complex. 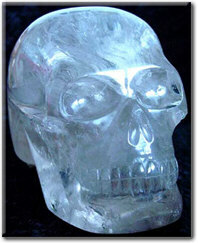 See a perfect diamond heart energy in the crystal skull flowing into your heart chamber. Once again the crystal skull starts to rotate and forms a perfect cubed shape (which is part of sacred geometry) which is a result as the skull merges with each facet of the “Living Light”. Return your focus back to your inner heart and allow your heart to emanate a glowing light which is a part of the “Living Light” and beam this energy into the “Mother Earth’s” and the “Universal” Hearts. Beloved “Mother Earth” and dear “Universe”, we ask “YOU” to please ignite the power and glory of your essence within our hearts now. As some of you know, there was a group of us who began to offer other world peace meditations from January 1st of 2009 through January 1st of 2011, a series of 27 meditations linked to the number 13 and the energy of the crystal skulls. We then decided to join forces with Sharon Pitt of the UK for a series of 2011 meditations from August 1st through the end of 2011.We wish to acknowledge Sharon for continuing the energies we started throughout the year of 2011. However, through the formation of the new International Crystal Skull Network (ICSN, April, 2011) these meditations since last year have become one of the first key projects for this new network which you may decide to join (see below). Starting on January 1st, 2012, ICSN has introduced this slightly new meditation which we hope you will continue to join us as we perform the meditaton on the 13th day at the 13th hour of each month in 2012. The public mailing list is where we will keep the members informed about all the new information and updates related to the meditations. To join the Crystal Skull World Peace Meditations mailing list you can enter your email address below and click the Join Now Button. All the information to describe the goals and ideas for this series of meditations is given on the page shown above. We also are seeking to create connections with other groups who offer peace meditations, to see if will join us. The best way to support this project that we have found, is allow your inner inspiration to guide you. All help and support is very appreciated. To a great 2012 and beyond -- now it is time for us to find new ways to celebrate and come together to work together to achieve great events and activities to bring peace and harmony to our world.